Terrell J. Starr has been Columbused by many in the mainstream media in the last several weeks. As the Russian hack on the 2016 election and President-elect Donald Trump’s relationship with Russian leader Vladimir Putin dominate the headlines, outlets are looking for a fresh take on Russian politics and American vulnerabilities. Terrell J. Starr—tall, black, lanky, with a Detroit accent, and who is just as likely to lay out facts in Russian as he is to compare Putin to Marlo Stansfield from The Wire—has stepped into the gap. He may not "look" like your typical Russian/Eastern European political expert, but with a Fulbright scholarship and degrees in journalism and ethnic conflict, Terrell J. Starr just might be black Generation X’s best chance to understand what is happening in this postelection Trump/Putin world. 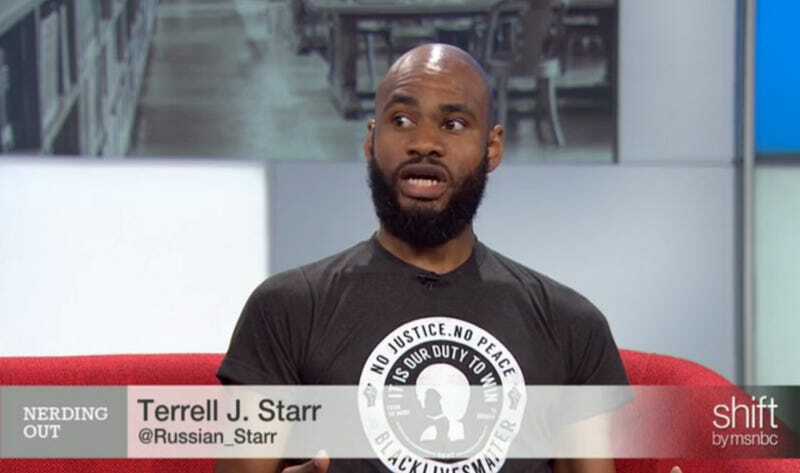 Starr spoke with The Root about his experiences in Russia, what really happened with the hack and the racial dangers associated with Trump’s cozy relationship with Putin. “I grew up in inner-city Detroit; both my uncles sold drugs,” Starr says. Not exactly the background many people think would lead to becoming one of the media’s newest experts on Russia. With help from family and some teachers, Starr went to Philander Smith College, a small, private, historically black college in Little Rock, Ark. “Around my freshman year in 2001, there was an international volunteer program that I signed up for,” says Starr. But that trip changed his life and set him up for the career he has today. “One of the first things I noticed when I was in Moscow was like, 'How did all of these Africans get here?' I thought I was going to be the only one,” he says. After a few months on his first trip, Starr was intellectually sold on Russia. “I fell in love with the language. I didn’t understand a word of it, but I loved how it sounds,” he says. He traveled through Estonia and Georgia and was in Ukraine for the Orange Revolution in 2005. The more he traveled and learned, the more enamored he became with the politics of the region, and how the racial dynamics of America fit so well into the politics on the ground in the former Soviet republics. “Georgians considered themselves black. Poles are like the white trash of Europe. I had no idea I would learn so much about race. Especially from people who, by American standards, would be considered white,” he says. Through his travels and research, Starr has seen how Vladimir Putin’s Russia initiates cyberattacks and foments dissent. While various former republics attempt to break the political and economic chains that Russia has on them, Putin usually starts with a disinformation campaign to discredit political leaders who would stand against him. “Putin did this in Adjara, the Ukraine and South Ossetia,” relates Starr as he runs down a list of nations Russia has attempted to disrupt politically through cyberwarfare in recent years. During the Ukrainian presidential election of 2014, four days before the vote, Russian hackers calling themselves CyberBerkut shut down the Ukrainian election commission for 20 hours. This attack destroyed hardware, software and the ability to track voter turnout. On Election Day, minutes before the polls closed, CyberBerkut hacked into the election-commission website and posted false election results that were mysteriously reported by Russian television almost immediately. Given that history, it’s not hard to understand what Russia was capable of—with Donald Trump’s help—in America. Crowdstrike, the private security firm famous for uncovering and tracking down those responsible for the Sony email hack, has been onto the Russians for months and shared information with the CIA. As early as June, it filed reports that the Russians had hacked the Democratic National Committee and were sharing emails with WikiLeaks and the Trump campaign. Starr notes that a likely Russian paid hacker known as Guccifer 2.0, along with others, is contacted through the dark web to do the dirty work Russia doesn’t want to get directly implicated in. “All of these attacks have been targeted at some form of racial strife,” he says. When the Ukraine elected a pro-Western leader, Russia spread disinformation aimed at stoking pride among ethnic Russians in the nation. Russians were encouraged to "take their country back" and take up arms against other ethnic groups and leaders they didn’t respect. Not a far cry from President-elect Trump, who on more than one occasion alluded to shooting Hillary Clinton. So what does this mean for America, and African Americans in particular, heading into a Trump presidency? The potential parallels between the rise of Putin, and the commensurate racial violence against people of color and the rise of hate crimes, and the election of Trump are eerie. In an attempt to distract from a sagging economy and his own corruption, Putin has tacitly endorsed white nationalism/Russian pride and turned a blind eye to violence against African immigrants in particular. African students and businesspeople are regularly assaulted, killed and attacked on subways and in public spaces in Moscow. Putin and state-controlled media focus almost exclusively on mythical “black drug dealers” to justify this fear and violence. Even more concerning is the boost that the Trump presidency gives to growing ties between Russian and American white nationalist and Nazi groups. "[Former Ku Klux Klan Grand Wizard] David Duke has been going to Russia and Ukraine for the last 10 years. During the Soviet period, [white nationalist groups] were illegal,” Starr points out. It’s no coincidence that there was a huge white nationalist convention in Washington, D.C., just a few weeks after Trump got elected. The kind of day-to-day violence experienced by Africans in Russia coming to America seems less like a worst-case scenario and more like a sincere possibility. So how does Starr suggest that African Americans view the Russian hacks and the future of a Trump presidency?